Whittlesey Athletic celebrate their PFA Senior Cup Final success at the ABAX Stadium. Photo: David Lowndes. 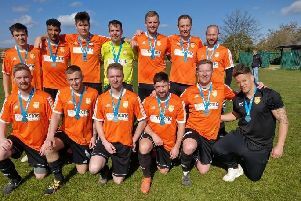 Andy Lodge’s lads lifted the PFA Senior Cup for the second successive season after sinking fellow Peterborough & District League Premier Division side Langtoft United at the ABAX Stadium. Ben Moore of Langtoft has an attempt on Whittlesey's goal in the PFA Senior Cup Final. Photo: David Lowndes. It was a final which lacked the edge-of-the-seat excitement of their penalty shoot-out triumph against Netherton United in the 2015 showpiece. This season’s spectacle was settled by a solitary strike from Adam Piergianni, who met Ricky Hailstone’s fine 20th minute free-kick with a perfectly placed diving header. But it was nowhere near as comfortable for Lodge’s lads as their 38-point superiority over Langtoft during the course of the league campaign might have indicated it would be. And they had to see out the final few minutes with only 10 men as hero turned to villain with Piergianni being dismissed for a couple of ill-judged sliding tackles in increasingly soggy conditions. Dan Jenkins of Langtoft (red) battles for possession with Whittlesey Athletic's Adam Piergianni in the PFA Senior Cup Final. Photo: David Lowndes. Earlier Whittlesey frontman Matt Heron, who had twice tormented Langtoft in Premier Division games this season, fluffed a couple of good chances before his side hit the front. He skewed a shot wide of the near post before guiding a header against the legs of goalkeeper Andrew Isabell. Piergianni showed him how it is done though, when making the vital breakthrough. Langtoft rarely threatened in the opening half with Whittlesey goalkeeper Lewis Moat’s only noteworthy piece of work being to smother a Steven Slack shot from a tight angle. But Ryan Hunnings’ men, playing in their biggest-ever fixture, were a much tougher proposition in the second period after being livened up by the half-time introduction of Tony Wooding. Whittlesey's Adam Piergianni is sent off by referee Jonathan Amess in last night's PFA Senior Cup Final. His endeavour earned the corner from which Dan Jenkins headed wide before Whittlesey defender Ash Moore almost sent a back-header past Moat. The Whittlesey number one reacted smartly to avert that danger and handled well moments later after Jamie Warner had unleashed a 25-yard half-volley on his target. Whittlesey then squandered a couple of fine chances to extend their advantage. Joe Butterworth’s effort was weak and easy for Isabell after he had been picked out by a classy Hailstone reverse free-kick before Heron drilled wide from 10 yards after a weak clearance had landed perfectly at his feet. The dismissal of Piergianni, who received a second caution for a second sliding tackle of the second half, with five minutes to go boosted Langtoft’s hopes of snatching a leveller. But a team without their suspended top-scorer, Joe Dobson, couldn’t threaten as Whittlesey set off for their new non-league dawn in triumphant style. Whittlesey have been promoted to United Counties Division One next seasom after finishing second in the Peterborough Premier Division so they won’t be able to make it a hat-trick of PFA Senior Cup triumphs. WHITTLESEY ATHLETIC: Lewis Moat, Kev Gilbert (sub Sam Donohoe 66), Jack Bates, Jake Pell, Rikki Wilmer, Ash Moore, Joe Butterworth, Ricky Hailstone, Liam Harrold, Matt Heron, Adam Piergianni. Unused substitutes: Lee Colbert, Harry Jenkins, Adam Moore, Luke Bonney. LANGTOFT UNITED: Andrew Isabell, Dan Jarman, Nathan Fryar, Dan Jenkins, Steven Slack, Nino Nuzzo, James Duffy (Sam Thompson 79), Jobi Froud, Jamie Warner (sub Ben Moore 72), Daniel Morris, Keishon Wilson (sub Tony Wooding 46). Unused substitutes: Daryl Todd, Daniel Smith. OFFICIALS: Referee - Jonathan Amess. Assistant referees – Lee Hartley, Phil Hayes. Fourth official – Zahid Bashir.